Corporate financial planning plays a key role in unlocking and managing growth that goes far beyond just looking for capital. This white paper by Lantern Capital Advisors describes the key steps required by growing companies in order to unlock and manage growth. 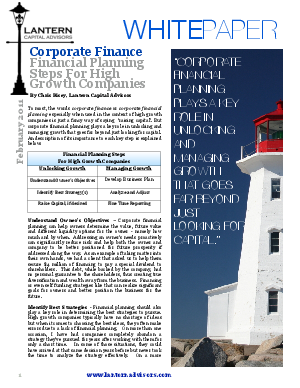 Understanding corporate finance is a critical factor in a company being able to plan for and execute growth.